To the Cherokee and other southeastern tribes, strawberries were associated with love and happiness. To the Cherokee and other southeastern tribes, strawberries were associated with love and happiness. Some Cherokee families still consider it good luck to have strawberries in the house. 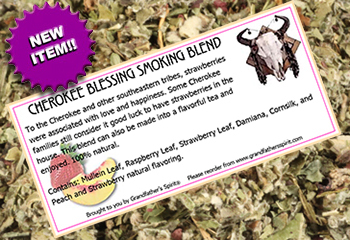 Contains: Mullien leaf, damiana, red raspberry leaf, strawberry leaf, cornsilk, and strawberry and peach natural flavors.